Summary: What if on the first day of class a complete stranger comes in? Norm does not know much about the way kids behave in his new class, but he really wants to learn and to belong. 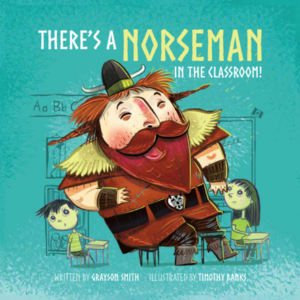 He is VERY different, but he brings his own special talents to the class and with the help of the teacher and children he soon fits right in. WITS Connection: Helping and seeking help, inclusion, social responsibility, kindness, helping others, Indigenous. Find answers to these questions so you can understand more about Norm’s history, ancestry and culture ( hhttps://www.historicacanada.ca/content/heritage-minutes/Vikings ). When did Norsemen first come to Canada? Definition of a Norseman: Another name for a Viking, a native or inhabitant of medieval Scandinavia or areas colonized by Scandinavians during the Viking period. (https://www.thefreedictionary.com/Norseman). 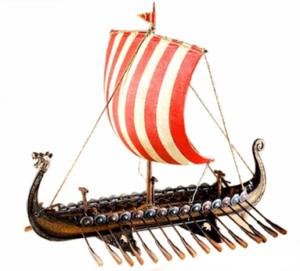 Viking ships: How do these boats move? (sail, oars) How did they know where they were going? Who already lived in the places where the Norsemen visited?When people immigrate to Canada today where do they come from today? 3. Look at the cover of the book. What do we learn about Norm? (He’s big, he dresses very differently). What does his face say about how he is feeling (jolly, happy, laughing)? What do the children’s faces say (worried, concerned, sad)? Why might they be worried or unhappy? What does Norm do that frightens the children? He does things that usually get children into trouble (He accidently rips pages in the books). Find out where each child’s family (ancestors) came from. Find a costume from that group of people? ENGAGE THE PARENTS! Find a picture of the costume on line and print it out. Create a collage of pictures to show what everyone would look like if they work their traditional outfits. What were Norm’s special talents? (He was tall and could hang things on the wall. He has a great laugh. He tries hard and doesn’t give up.) Have each child think about their own special talents. (kind, good at sports, likes to sing, can draw, can read really well ). How can they use these talents to help other children or to contribute to the classroom? Have each student fill out their own STUDENT PROFILE – (TOPICS: Name, Hometown, Home language, My Talents or Strengths, Things I’d like to be able to do better, What my teacher can do to help me. ) See an example at the end of the book). ENGAGE PARENTS IN FILLING OUT THE “All children are unique handout” below. Use the OLD NORSE ALPHABET to write your name! (see end of book or use the alphabet below). Help children write their names in their ancestral languages.